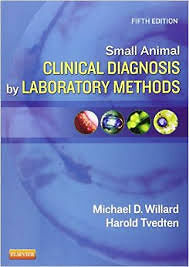 A quick guide to appropriately selecting and interpreting laboratory tests, "Small Animal Clinical Diagnosis by Laboratory Methods, 5th Edition" helps you utilize your in-house lab or your specialty reference lab to efficiently make accurate diagnoses without running a plethora of unnecessary and low-yield tests. It provides answers to commonly asked questions relating to laboratory tests, and solutions to frequently encountered problems in small animal diagnosis. For easy reference, information is provided by clinical presentation and abnormalities, and includes hundreds of tables, boxes, key points, and algorithms. This edition, now in full color, is updated with the latest advances in laboratory testing methods and diagnostic problem solving. Written by noted educators Dr. Michael Willard and Dr. Harold Tvedten, this book may be used as an on-the-spot guide to specific problems or conditions as well as a reference for more detailed research on difficult cases.